Mac University – Sea of Macs in a Lecture Hall! Mac usage has long been popular in higher education, and speaking from experience Mac use is really common around my school, with Apple hardware appearing just about everywhere. 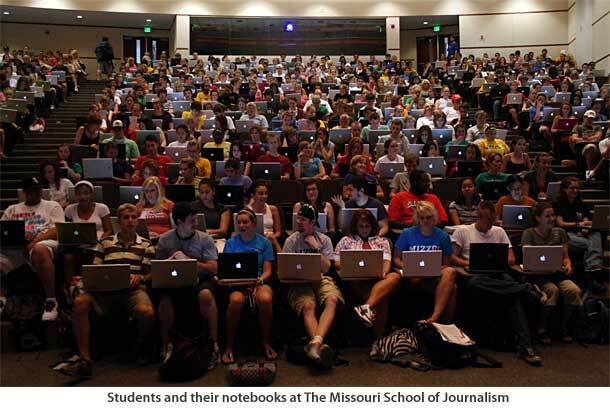 Seemingly everyone has an iPod or iPhone, a Mac, there’s a lot of MacBook’s, even a few iPad’s floating around… but even on a techy campus, I have seen nothing quite like this picture that was apparently taken at the Missouri School of Journalism. Wow, that is quite a classroom. Just a sea of Apple logos glowing back at the professor. I’m sure all the students are really paying attention to class, they’re all taking notes and aren’t goofing off. Of course, right? Thank you Sean for sending in the picture! If you know of the original source link (aside from the Missouri School of Journalism) then share it with us in the comments! Statistically this may not be too unusual, as some recent data shows that up to 70% of college freshmen are using Macs which should be a good indicator of a healthy Apple interest by the nations youth. It will be interesting to see how that usage changes over time… will the Mac continue to be popular in higher ed, or will something else take over? I’m sure it largely depends on how Apple handles the Mac in the coming years, and how students and consumers respond. Anyway, I thought this was an interesting find that was worth sharing. THAT IS A HUGE!!!! LOAD OF MAC NOTEBOOKS!!!!! DAMNN!!!! As a penniless student and a Mac lover, I feel entitled to deliver a rant about Damn Rich Nerdy Kids ™ right now. Sorry, but it’s not PC! It’s MAC, ok? well,guys,am a chinese guy as you! oh,my lord!it’s really great things,as a computer company,almost toplop is theirs, I can’t say:great!You are!